Later this week, I’ll turn 55 years old. I tell people that there is no positive spin on turning 50. When I turned 30, that was cool; even turning 40 was OK. When you turn 50, you begin to feel older (not really old, but definately older). And then there is the realization that I am now half way through my 50’s. Dang! One thing that I find myself desiring at this age is to let someone else do the tough projects around our house. My wife has said several times that “we have let our house go.” There are a number of home improvement projects which need to be completed, most of which are man’s work. When she says we have let our house go, what she really means is I have let our house go. She is right in some respects. I have been hard at woodworking for the past three years or more. 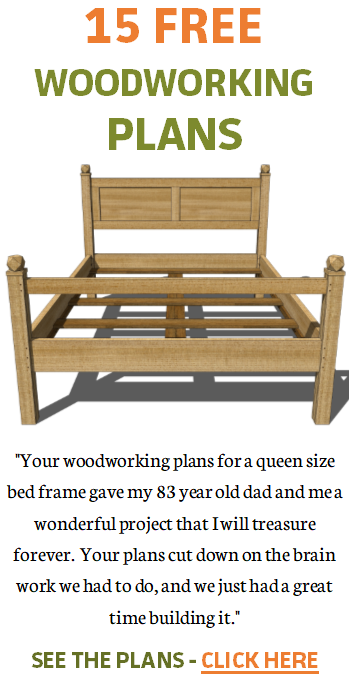 I can’t remember another time in my life when I have had more woodworking fun than now. So, there are a number of indoor projects which need fixing. And my yard has never looked as bad as it does now. My workshop is awesome. Not woodworking and not fun. The photo above shows a project which I have been avoiding. This is our small upstairs bathroom. While you can’t see it now, there were two areas in the ceiling which had water damage. Very slight water damage. We put a new roof on the house late last year which fixed the leak, but as I prepared to paint this bathroom last weekend, there was no denying the ceiling would have to be repaired. The repair? 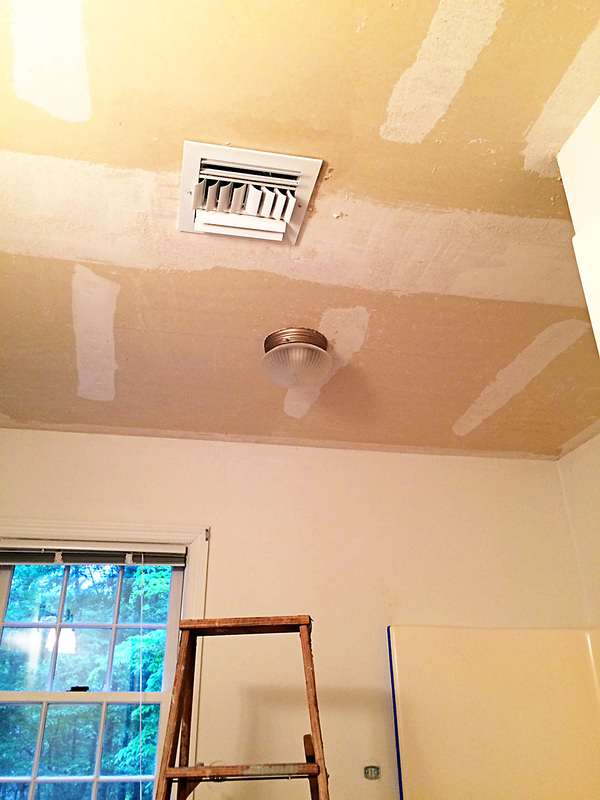 Removing the textured, popcorn ceiling. This is the third room in our house which has been rid of this now, generally hated, ceiling treatment. Some of the popcorn stuff had already fallen. My thinking was to just give it time and see how much of it would fall by itself. Time is up – it all needed to come down. So far, I have determined there is nothing which creates a bigger mess in a home than removing a popcorn ceiling. The textured stuff falls and creates a layer of debris which is not to be under estimated. It lands even in the most out of the way places (like under the toilet seat). Call the man. Let someone else do this messy job. Poor me for having to do it. At my age, there is some work that is better accomplished by those who do it all the time. They have the technique down, have the right tools and can do this kind of work quickly. 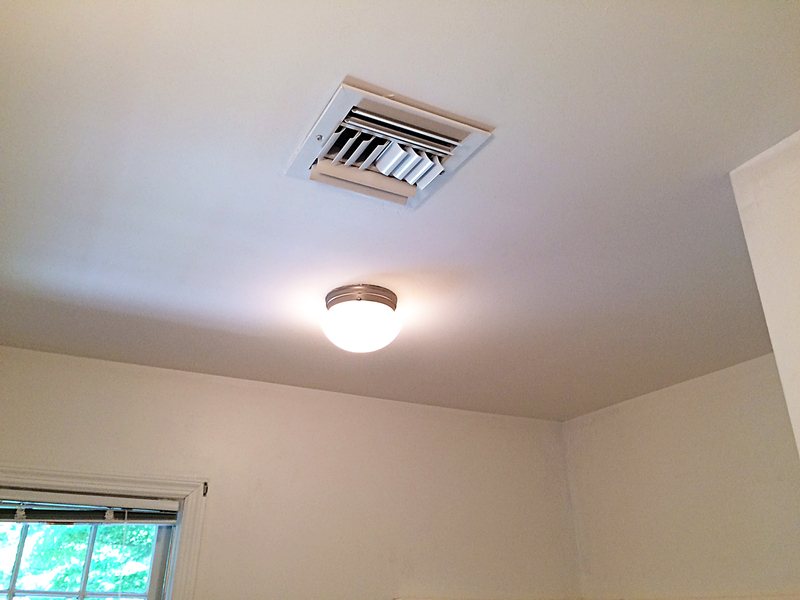 The work is ladder work – not fun, the heat which emits from light fixtures is very noticable; again not fun. I’m covered in dust… man, this is just no fun. But, all this time there was a feeling in the back of my mind, barely poking its head out from under all the complaining that was rolling around in there. The feeling of laziness. I should be happy to have the home I have; popcorn ceiling or not. I can do this – just work hard and get it done. I would hate to tell my family and friends that I paid someone to do something that I am clearly young enough and very capable to do. I am glad I didn’t call the man. And that is the point of this post. We all have that little voice in our head which tells us to stick with it. When I do call the man to fix something (like electrical or plumbing), I wonder if I could have fixed it. Man-up, buckle-down, get the job done. It feels good when you can look back at your work and say, yep I did pretty good. I am not quite ready to use my almost old age as an excuse to call someone else to do this work. I built this about fifteen years ago – red oak and tiger maple. I’ll admit that the side loading drawers are unusual, but there is more usable space with the drawer configured this way. 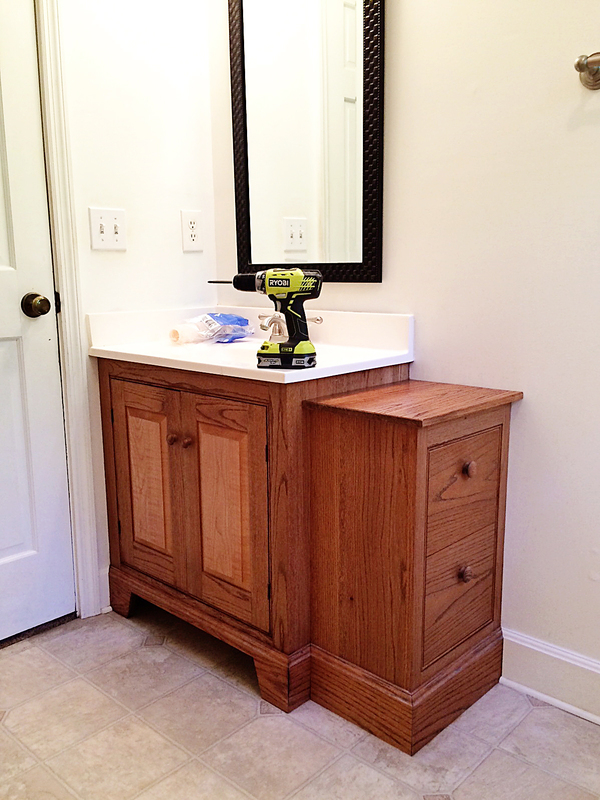 The size of the vanity was largely determined by the stock cultured marble top I got at the home center. I purposely omitted a fase drawer front which is common with vanities. Two larger doors lets more light into the small space below and it is easier to find things. The reason the drill is there is I refinished the oak top; it was looking rough. 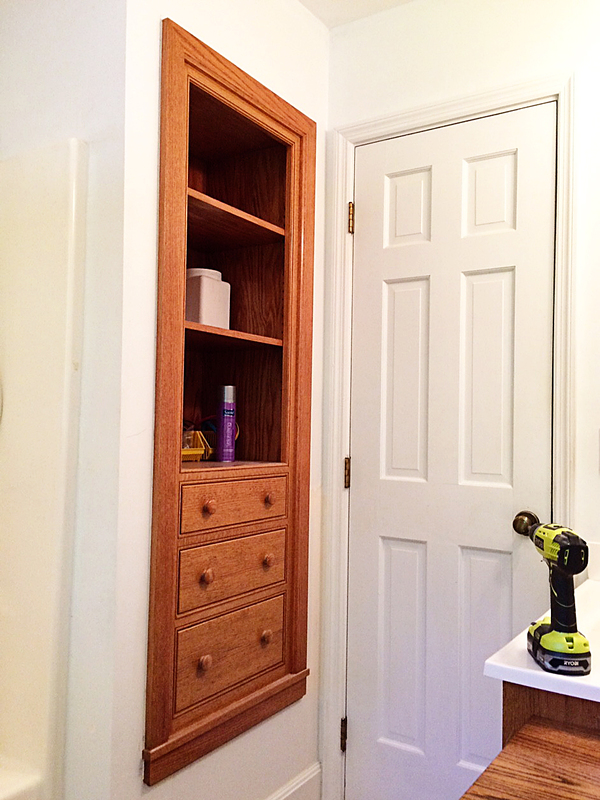 Opposite the vanity – a built in cabinet. This red oak cabinet was a much needed addition. During a plumbing repair (which I didn’t do) we realized the space behind this wall was largely unused. The constuction of this cabinet is cronicled in this series of blog posts. Recently, my wife and I have steam cleaned the carpet throughout our house. Today, I have some plants to get in the ground. The front yard needs cutting and then this week I’ll finish up some small projects around the house. All this work is related to a family wedding next weekend. My sister and brother-in-law will be staying at our house for a few days. Sadly, we often need visitors coming to motivate us to get our house in shape. I’ll have to admit that I’ve had more than a few projects the last couple of years where I just called ‘the man.’ My standard has moved to, “Would I enjoy this project?” There is also the time issue. After working, I only have a small amount of time left in my week, so if I won’t enjoy the ‘craftsmanship’ of a job, the man gets called. 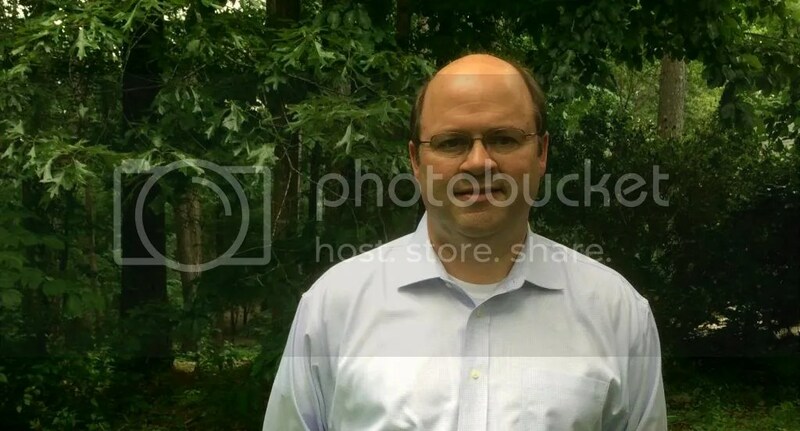 Hey Andrew – I agree the time commitment is an important consideration. Last fall when we had our sizable screen porch and deck stained, we called a painting contractor. He and a helper did that and our front porch in a little more than two days. It would have taken me at least a month of weekends to do the same. Congratulations for pushing through, Jeff. I am the man, but I also know what it’s like to have home projects that I would sooner avoid. Especially if they’re cutting into my woodworking time. Remember though that when you call the man, you’re helping to put food on his table. If you think about it that way, it makes that pill easier to swallow. I frequently hear folks (usually the man of the house) say they could do it themselves, but they don’t have the time/energy or whatever. I always say I’m glad for that, and thank you for the work. It usually makes them feel better about the whole thing. Those bathroom project look great, I’m going to have to go back and look at those posts. I just wish you were close by. The age of my home is such that I could send you a lot of work which is beyond my ability. Thanks for the comment. I’m very close to being done with this kind of work anyway. My partner and I are making progress setting up shop in his basement. We have almost all the equipment needed and are both chomping at the bit to get started. Also, my wife and I talked about the larger rooms in our home. We will have to hire out the removal of popcorn texture in those rooms. They are much bigger jobs. It’s beautiful! I was just saying yesterday that is the single most awful project to do! Thanks Holly. “Awful” describes it well. The sad fact is that there are very few folks left who can actually do things like this for themselves. Calling the “man” is the only option. I have no issue with supporting the “man” when it makes sense. I’ve shingled many a house, but never again. I work in manufacturing. I actually had to create a study sheet for new hires to teach them to read a tape measure. It has become that common a problem. Anyway…the ceiling looks great! That built-in is awesome too. I agree with many post above. I read somewhere that when considering doing a project, consider your time cost along with your experience (or know how) I also factor in the “do I REALLY want to do this” factor. Sure, there are a lot of things I CAN do, as I tell my wife, but it will likely take me much longer than just calling a professional. All in all, there are a lot of variables to consider, your time/cost, your experience, the time restraints (when does it have to be done) and finally, is this REALLY what I want to be spending my time on. That being said, I have learned a lot over the years by doing things I probably should have called someone else to do – most of that learning has been in the form of time and money. But like all my projects, I’m usually limited by time and money – neither of which I seem to have at the same time… :). But your projects look great. Good job. David, thanks for your thoughts on this. This was a nuisance type DIY job. It was a small job, so small that paying someone to do it wasn’t going to happen. Maybe if this was part of removing popcorn texture from the other rooms in my house – that is worth calling the man over. It was extremly messy. I completed the job in about five evenings. But, still it was hard to get motivated to do it after long days at work. So, I am glad I stuck with it and saw it through. Your ceiling looks brilliant, and a nice complement to the stunning vanity and built in cupboard. My husband does almost everything around our house (except electrics which are a bit…tricky in Chile) but I should show him your blog to see what finishing techniques give you! Thanks for the birthday wishes. Maybe someday, I’ll be as far along as you in removing the popcorn.